Cameron Hackett is curating a special collection exclusively for Niche and we are so excited to debut her work at our First Friday event on August 3! Get to know more about her and hear about her inspiration for the collection below. "It is no secret that I love color, texture, and design. You can easily see that love expressed through my art and home. I am a very ‘care-free’ painter using big brush strokes and pallet knives to create texture and depth in my art. I am drawn to bright, saturated colors that make a big impression. I have attempted to go neutral several times and it just doesn’t work for me. Color makes me happy and I believe that every home could use some. I was very excited when Niche reached out to me about putting my art in their studio. I first heard about Niche from Courtney Moran, a friend and co-worker of mine who is also an instructor at Niche. When Jaclyn presented this great opportunity my first thought was movement and the desire to incorporate movement into my pieces just like the movements made while practicing Pilates. I enjoyed the opportunity to visit the studio and love that the studio is an old row house with great walls, floors, ceilings, etc. I left feeling inspired to create something that would speak to someone who was trying to challenge their body and mind while feeling relaxed, calm, inspired, and happy. Most of the time I begin with my favorite colors and continue layering and tweaking over the course of time. 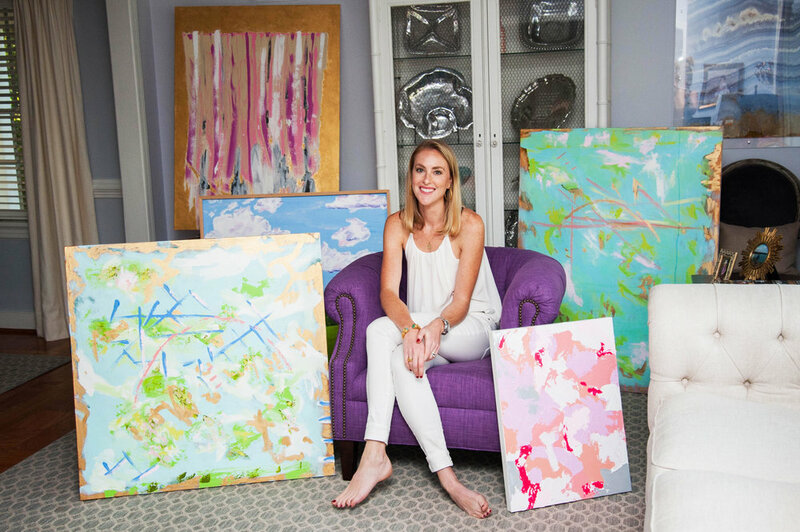 For this specific collection, I began with three light and airy pieces and moved on to create two bold and geometric coordinating pieces. I have a hard time sticking to one style of painting and like to try different things and simply get lost in the process. I know art has to speak to you on a personal level and I hope that you may feel inspired by these pieces. If anything else, I hope that the colors bring some sort happiness to someone’s home and encourage them in some way. I am truly humbled to display my art up in Niche’s Studio and I can’t wait to see what First Friday is all about."